With state-of-the-art roof hatches from our company, it is easy to modify an office building so that it has convenient roof access. We can provide you with a commercial roof hatch with a design that fits the layout of your business establishment. Get the best deals on roof hatches when you shop with us. You can also turn to our company for floor access hatches of exceptional quality. Gaining access to the roof of a commercial building is often easier said than done. This is especially true if the initial building design did not include a roof hatch with a proper access point. 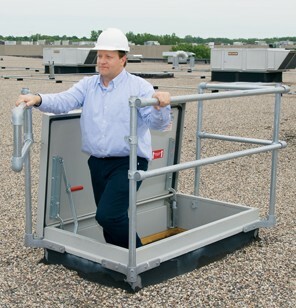 Our company offers roof hatches specifically designed to provide fast and efficient access to the roof of a building. Each commercial roof hatch comes with a ladder or stair access, depending on which design makes more sense for the layout of your establishment. Set up a consultation with a skilled contractor to determine what kind of roof hatch would best suit your place of business. If you need assistance selecting the right type of roofing hatches, turn to our experts for help. We can send a qualified contractor to your area to perform an inspection and advise you on which roof hatch would be the best fit. Do you need to make repairs to your company's roofing system? Maye you need to install new equipment on the roof. Regardless of the reason, the fact remains that in order to gain access to your roof, you require a proper roof hatch. Our company offers highly competitive rates on a multitude of roof hatches. You get to choose one with the perfect style and access point for your building. Contact us today to discuss the right kind of roof hatch for your establishment. We are proud to serve customers throughout Maryland including Annapolis, Baltimore, Columbia, Glen Burnie,and Pasadena.